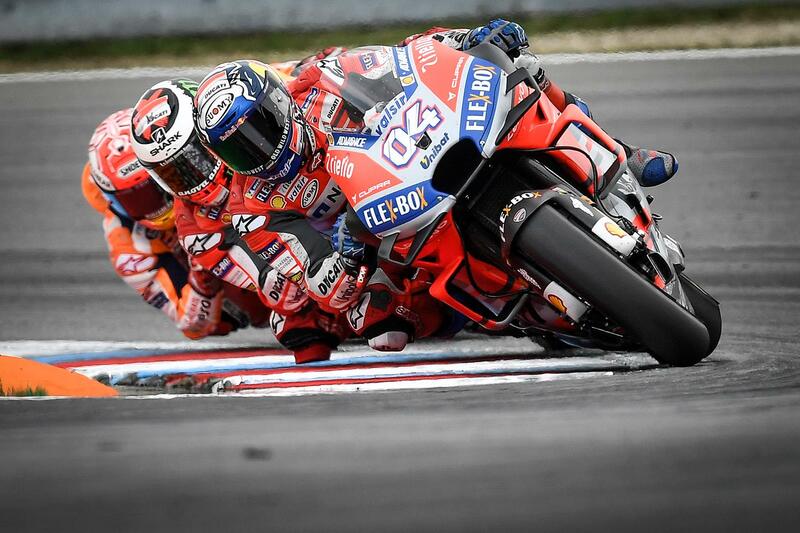 Andrea Dovizioso (Ducati Team) has taken his second win of the season in incredible style in the Monster Energy Grand Prix České republiky as a three-way fight for the win raged between the 04, his Ducati teammate Jorge Lorenzo and reigning Champion Marc Marquez (Repsol Honda Team). By the flag it was a Lorenzo vs Marquez classic on the final lap to decide the podium positions, with the ‘Spartan’ taking second and Marquez, on his 100th MotoGP™ start, forced to settle for third – nevertheless marginally extending his Championship lead. It was also an anniversary for 'DesmoDovi' as the Italian celebrated his 100th race for Ducati with the win. It was Valentino Rossi (Movistar Yamaha MotoGP) who took the holeshot from second on the grid, with polesitter Dovizioso just losing out and shuffled back a place as Marquez retained his P3 through the first corner. Lorenzo wasn’t able to make a move from the second row and settled into fourth, with drama then hitting the early stages as a multi-rider incident saw Maverick Viñales (Movistar Yamaha MotoGP), Bradley Smith (Red Bull KTM Factory Racing) and wildcard Stefan Bradl (HRC Honda Team) crash out. At the front ‘DesmoDovi’ was quick to strike for the lead and he and Rossi dueled it out, but it was the 04 Ducati ahead over the line. Marquez then began to attack Rossi, before Lorenzo struck instead and picked the pocket of the number 93. Dovi led Rossi led Lorenzo led Marquez and it seemed it could be in for another Dutch GP battle royal – but that wasn’t to become the story of the race. It first became a long train with Dovizioso at the front and squabbles breaking out throughout, with Cal Crutchlow (LCR Honda Castrol) vs Johann Zarco (Monster Yamaha Tech 3), Danilo Petrucci (Alma Pramac Racing) vs both and the fight at the front stretching all the way from Dovi through Rossi, Marquez, Petrucci, Crutchlow, Zarco, Team Suzuki Ecstar’s Alex Rins and Andrea Iannone and Dani Pedrosa (Repsol Honda Team). By ten laps to go, however, a group of six had begun to emerge, including those who would fight for the win. Dovizioso, Marquez, Rossi, Crutchlow, Lorenzo and Petrucci had pulled out a gap, and the final showdown would be whittled down further. With expected race pace within the 1:56s and no one putting that in, it was a game of high speed chess – before five laps to go saw Lorenzo take Crutchlow to put Marquez in the middle of the Ducati duo at the front. The pin was soon to be pulled. A lap later and the laptimes dropped – with Dovizioso, Marquez and Lorenzo all bolting in unison to suddenly pull out a gap on Crutchlow and Rossi on the chase. The trio slammed down into the 1:56s and showed their hand, setting up the Czech GP for an incredible final few laps. Marquez attacked Lorenzo at Turn 4 as the duel began, but the ‘Spartan’ hit back with a stunner into Turn 6 that sat up the reigning Champion. With Dovizioso then with a bit of margin at the front, the number 99 Ducati threw everything at it to chase down his teammate – but through the final corner neither was just close enough for that final attack. That made it an impressive second win of the season for Dovizioso and his first at Brno, with Lorenzo second and Marquez completing the podium on his 100th MotoGP™ start. The fight wasn’t over, however. Just behind the breathless battle for the lead, another duel was lighting up the final lap, and it was Rossi who was able to pick the pocket of Crutchlow and beat the Brit to the line by just hundredths – taking the rider from Tavullia over the 6000 career points mark 22 years after his first ever GP win taken at Brno. Petrucci took sixth ahead of Zarco, with Pedrosa pouncing on the Suzuki riders to take eighth by the end. Alvaro Bautista (Angel Nieto Team) was also able to move forward and took ninth in his 150th premier class race, with Iannone beating Rins to the honour of completing the top ten. 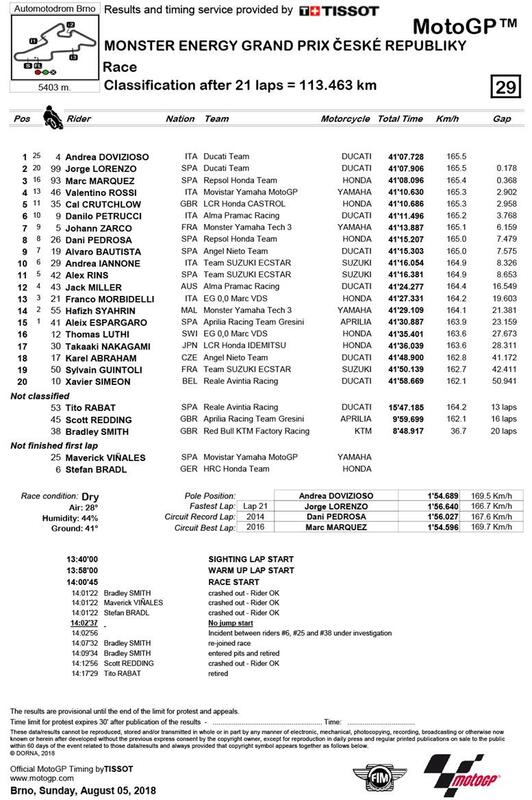 Jack Miller (Alma Pramac Racing) was P12 ahead of top rookie Franco Morbidelli (EG 0,0 Marc VDS) back from injury, with fellow debutant Hafizh Syahrin (Monster Yamaha Tech 3) for pretty close company in fourteenth. Aleix Espargaro (Aprilia Racing Team Gresini), also returning from injury, completed the points scorers.